I got tired of rating teams and decided to rank courses instead. These are just ball park rankings based on compared times from the results over the year and assume that the weather conditions on the day and the course conditions are dry for all. Attached is the exel of the course to go with this screen shot. You are welcome to disagree, make your own list, add to this list. Things that effect difficulty assuming all dry conditions are of course, hills, roughness of terrain, number of turns and 360 doglegs and such, and of course the fact that some courses are not exactly 5K. In looking at my list I think Parkside when dry is really much faster than many people take it for. It has that long climb at the start but in reality much of the middle mile is down hill and I have seen some very fast times on this course. Hacker and Namath both ran about 15:20 in the mud at Parkside in the Footlocker regional and I can only imagine what they would have run in dry conditions. Great idea and thank you for sharing. You are totally right about Parkside. Early September Parkside is going to be muggy and slow. Early October Parkside is perfect. If you get a cool and dry day in November it is near perfect. This is great. I think that Meadow links in Manitowoc is a little tougher than rated. Last year Basten ,Potter and Perez ran 15:51, 15:58, 16:17 at the Manitowoc invite and then Basten and Rink ran 16:03 and 16:08 at sectionals there. All ran similar times on a sloppy ridges course. I have been to all these courses except, Standing Rock( I did cross country ski there), Arrowhead, Griak, Manitowoc, and Fennimore. ( I am talking about the course they used for their relays where they had one hill that runners had to almost crawl up pulling themselves by bushes) . I added Washington Park in Milwaukee at 8.0 and lowered Grant Park to 4 which I have been to but it was pretty wet the year we ran there. I would say Fennimore is the hardest I have ever scene/ran. The hill has a name, it is called the “I can’t hill”. Fennimore’s hill is hard and the course is the hardest I’ve ever run, but Lodi has one hill that is worse than Fennimore’s. granted you only have to run it once though. Update to Course Difficulty ranking- I have added new courses and changed some rankings based on input Make sure we assume solid footing and temperatures in the 70’s and down. Everyones course on a 90 degree humid day is going to run slow. If you check Jack Daniel’s table he has a auto correct feature for temperature conditions. Input I received about someone who ran Yankton trails said it was very flat and fast except for a few cosmetic “hills” definitely not over a 3 but an honest distance. I ranked Deerfield a .8 and anything else under 1 will be assumed to be significantly short unless verified. This may or may not include Chocolate City until someone wheels it with a 2 meter wheel- no gps, no bikes or motorbikes. I used a farmers rod measurer years ago and the darn thing stood over my head and you had to count every turn and have someone with you to record each spin. I would trust it more than a gps even today. Per coach Behnkes comments on the SPASH CC site, Smiley is the hardest course SPASH runs, and Manitowoc is the fastest even after their hardest week of training. I’ve only ever spectated, but having spectated both, I’d argue those two courses ought to flip positions. Oh @westharrier and his favorite meet the Smiley Invite - ha! We haven’t run Smiley for over a decade but it was a great meet the last time we were in it. Over 50 schools and the largest meet in the state I believe. Not all in one race but still very big. We had some titanic clashes in D2 when we were in there agains Phillips for several years. They had great teams from the far North and we were from the banana belt and met up there in 1990 and 91 when we were ranked 1,2 in the state. Great fun. I do not remember the course as being extremely tough even with the one big hill to climb and I heard they took the hill out now but not sure. The layout may be totally different than in was 10 years ago so let’s get some more feedback from some coaches that run there now. I did look at this years times and they were slowish but with all the rain up there that would be expected. We have never run Manty’s course nor have I seen it but another coach rated it as a tougher course. More input on that. I won’t split hairs but if people think it is way off we will change it. Oh yes there was one year when they started the D1 race with about 4 teams not on the line and runners were streaming into the race from the johns, tents, and such that were scattered . There were even guys who joined the race from their warm ups out on the course. Mixup with the timetable. Not sure what year but probably before the present meet managers were in charge at least 12-15 years ago How am I sure because I had one in the portapotty, and another just coming back from his warm up who joined the fray. Funny now but not then. 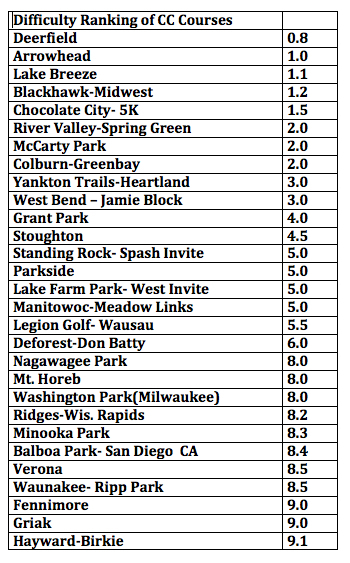 I wonder what Colburn Park in Green Bay and West Bend’s Jamie Block Challenge would be in your course difficulty rankings. It’s so easy to hype up Preble and in other past years, Neenah and Bay Port, because of all the McCarty Park’s up that way. There are of course different flavors of XC in Wisconsin and I’ve always thought of Appleton-Green Bay-Sheboygan areas as having blazing fast courses. Tough to judge Jamie Block because it is an early meet usually in hot weather. If there are any other good meet results from the course in mid or late season that would help. Colburn Park in new to me but coaches that have run that and other courses on the list can weight in with their opinions. The table is flexible and can adapt to reality as best we see it. I think we have a former state champion (and his dad) that are members here who could weigh in when they come back around. I have to disagree with you on this one. Sheboygan has no fast courses. The County meet may have been short this year due to construction altering it. Ramos never ran under 16:20 on that course (I think). Appleton,Green Bay and Manitowoc have fair courses. In my opinion it is the southern part of the state that has the blazing fast courses. i.e Arrowhead…Midwest. And to be fair the Northwest area courses are probably the toughest. That area never gets respect on this site yet there will be runners from that area in the top 30 for sure. Yet some of them barely crack 17 on the courses they run. I never take Midwest seriously or Arrowhead. Add at least 20 seconds on a “real” course. Also, correct me if I am wrong, but I thought I saw a post on here saying Verona is 4,930 meters, so add 15 or so seconds to those times. The track is where times matter. Meaningless in cross. It’s about who wins. I should have really said Kiel - Manitowoc - Two Rivers instead of Sheboygan. What do you think of the Plymouth Relays course? It’s a two loop course around the campus. Boring and add the fact that there are only 14 runners in each race with schools that traditionally are not very good and it ends up being slow times for every one. Long grass always too. I would place Colburn in the 1.5-2.0 range. There is one hill about a mile in that is relatively steep, but isn’t a back breaker. Other than that, it is mostly flat and fast. I would place Smiley comparable to Ridges. Ridges is definitely a tough course with an unparalleled environment, but Smiley is difficult in a similar way. With a big field, and a very narrow bridge about 450m in, you must get out fast and beat others to the bridge. If I do recall, there a good amount of hills on the back portion of the course that can really sap the energy out of you especially with a fast start and big field. I would also put Rolling Meadows (Fondy Relays) on the list at a 3.0. Not a particularly tough course, but there are some rolling hills and some slick footing as it is at the beginning of October. I think given where Fondy and State fall in the year, they end up being pretty comparable times. In 2007, Elliot Krause ran 15:27 at Fondy and 15:37 at Ridges. I ran 15:33 at Fondy, and 15:53 on a long course at Ridges. Additional comparisons could be done with both the Neenah men’s and women’s teams as they go to Fondy and almost always qualifying for state. I would like to nominate a G.A.L. measurement rating for courses like Deerfield. G.A.L. stands for “Girl At Lunch” – as in the volunteer girl from Valders’ lunch hour who measured Sean Pruitt’s 215-foot discus throw.